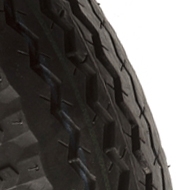 Browse our range of chunky wave tread pneumatic tyres and replacement trolley wheels. Choose from our wave tread wheel sizes from 220mm and 400mm diameter pneumatic wheels. We have large stocks and can deliver next day. Ideal for outdoor applications, our universal pneumatic wheels can fit many axles from 12mm up to 1" (25.4mm ). For a hassle free option choose a plain bore wheel with no bearings (PW ). Alternatively to make your equipment easier to move choose a Roller Bearing Pneumatic Wheel ( PWR) or for wet or marine environments choose a sealed ball journal bearing in your pneumatic wheel (PWP ). For more details on choosing the right wheel please view our measuring advice page or call the sales team on 0116 2764987 for personalised help.